ONE OF THE PLEASURES of being semi-Internet savvy (code for Internet Junkie) is the relationships that form. Although many of you are logistically too far away to get to know face to face, the computer screen can and does bring us together. Don't you love this about technology? One of the really cool people I've had the pleasure of "meeting" online, is Laura Dennis. She is a fellow memoirist who lives far, far away in Belgrade, Serbia. 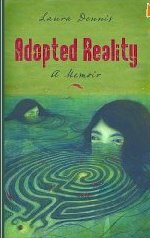 A few months ago I reviewed her book, Adopted Reality. You can read it here. Recently, Laura read my memoir, Reaching and posted a review on Amazon. She also sent me a series of questions focusing on the odd relationship I had with my mother. You can read them and the answers by clicking here. Thank you Laura for your friendship and for sharing your insights and encouragement. It's an honor to be acquainted with you. Great interview and what a web of support from other authors Grace...now if I could find time to start my book...but I will. Hey Grace, It's great to know you, too! Your memoir is amazing -- I highly recommend it!! Grace, a great interview and I'll check out the book because I love memoirs also and have a couple in line to read. Still reading and enjoying yours when I find the time, it's been pretty crazy around here the last few weeks.